To sign up to the Healthy Back Bag Newsletter, simply click the Request Newsletter button below and you will receive amazing special offers, discounts and access to secret sales. The Healthy Back Bag - Unique, Versatile, Comfortable & Fun! The Healthy Back Bag Company provides uniquely designed bags that keep wearers organised and more importantly healthy. Sign up to their newsletter today to discover how their bags can keep you happy and healthy! Explore their range today and choose from a range of sizes and designs. From cool patterns and plain prints to leather styles and outdoor designs - whatever your need, whatever your style, they have the bag for you. Uniquely designed in collaboration with a doctor and a chiropractor, the Healthy Back Bag moulds to the shape of your body and evenly distributes your load, keeping you comfortable on the go. Reducing strain on your neck, back and shoulders, their bags will keep you feeling great. Whether you're looking for a new outdoor hiking bag, a small everyday bag or fancy yourself a mini bag to hold your valuable, they have a size for every need. 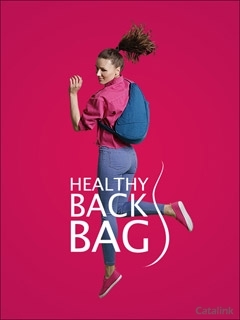 Sign up to the Healthy Back Bag newsletter today and explore their collection of comfortable bags and receive member only updates, offers and deals direct to your inbox! By Pressing the Request Newsletter button you give Healthy Back Bag (and their Data Processors for the specific purpose of delivering your emails) consent to send you their newsletter via email until such time as you choose to unsubscribe.